Positive reinforcement principles are used in all of my training classes. I have assisted various different trainers and seen a multitude of methodologies and the best results I have achieved are using positive reinforcement principles. I believe this works best because you get a dog that enjoys training and wants to offer you behaviors. Positive reinforcement training does not create any ill effects such as anxiety, nervousness, fear or aggression. I have seen firsthand and on numerous dogs the impact that punishment or correction based training can have on dogs. I have owned a variety of different breeds and have trained using a variety of methods. I graduated from the University of Delaware and concentrated on animal science and behavior. I studied learning theory and the different types of reinforcement and punishment and the effects it had on dogs. I trained one of my first dogs, a German Shepherd named Onyx, using correction and force. The trainer I was working with at the time told me I needed to show him who was boss. He was a tough dog and had a very high threshold. Simply saying or even yelling "No" did nothing. The trainer took control of Onyx and delivered a sharp leash correction several times on a prong collar. After this happened several times, Onyx became very frustrated and was showing signs of stress. After a couple more corrections he lunged and growled at the trainer. The trainer then returned the dog to me and asked me to work with him. I regretfully did what I was asked, but Onyx did not respond. He did not lunge at me, but avoided me completely. My instinct told me this was not working and I concluded our session. A couple of days later I came home from work and Onyx began growling at me for no apparent reason. I would just walk in the house or enter another room. Even if I was sitting at the table I would hear a low rumble. I knew something was very wrong, but wasn't sure what was going on. ​She explained the association that was being made and how I damaged our relationship and trust. I realize now that if I had continued correcting Onyx the situation would have gotten a lot worse and I could possibly have a dog with a bite history on my hands. A growl is a warning and just that. If you punish the growl, the growl may disappear, but the dog may then just bite without warning. A growl is a serious indicator and help is needed. It is in the best interest of both parties to seek professional help. After that I began to read every book that explained and encouraged positive reinforcement training. I even went back to my old psychology books and reviewed the different theories and quadrants. I attended numerous seminars including three with Ted Turner who specializes in training marine mammals. He really gave me a strong background on how to train animals scientifically and without emotion. He explained to us how he trained killer whales and other predatory species using positive reinforcement principles. It was amazing what one could accomplish! Having an animal offer themselves for examinations or vaccinations or something as simple as cutting nails (this really doesn't need to be the horrid ordeal it tends to be!). His seminars are very informative and he is a wonderful speaker. We all laughed when he said you can't tell a killer whale "No". Positive reinforcement training is about reinforcing behaviors you like and want repeated and catching the dog doing something right! A trainer will show you how to break a behavior down into simple steps and then raise the criteria gradually. By being proactive and managing your dog correctly until he/she is trained, you should be able to prevent accidents or misbehavior from happening most of the time. If a dog is unable to rehearse or start a bad behavior, it will cease to exist. This will set the dog up for success. Most of the problems I see start with poor management and too high of expectations from the owner. Dogs don't instinctively know how to do anything except eat and relieve themselves. It is up to us to train and show them what we want patiently. 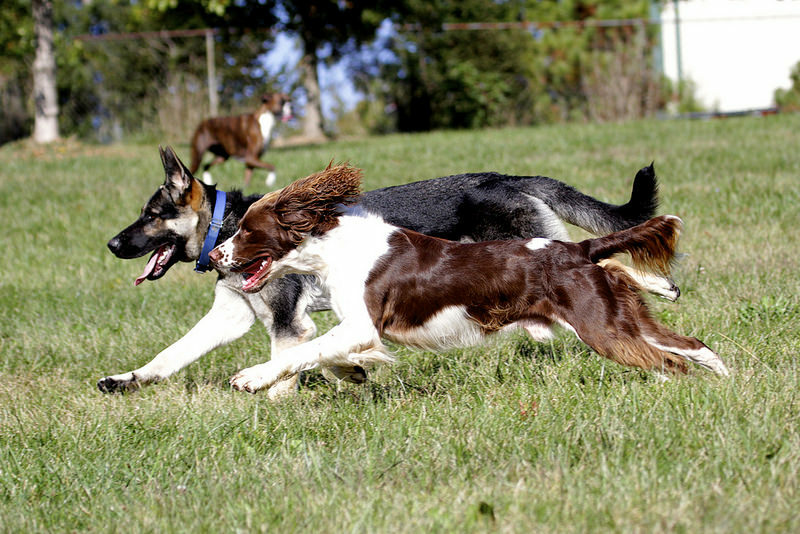 Dogs learn through repetition and consistency. You can't expect them to learn after a couple of trials. It must be repeated and reinforced using different types of rewards, in various environments and with distractions added gradually. These are the three parts of dog training: understanding the behavior and what we mean; being able to work in various environments and with multiple distractions. The latter part is what takes time to train and work through. Dogs always perform best in the home, what’s important is that they perform everywhere. Your dog’s classroom is everywhere and always! There is a misconception that this type of training is based completely on food and nothing else. This statement could not be further from the truth. Food is given, but so is verbal and physical praise, play and anything else the dog desires known as life rewards. The word positive in positive training does not mean good, it means to add something. Positive reinforcement is adding something to get a behavior to repeat itself. Food typically is a powerful, primary reinforcer and works very well as dogs want this more than anything, but a good trainer will tell you it is imperative to vary your rewards. This keeps the dog highly motivated. My dogs were trained using food, play, and just praise. They work for me anytime I ask and in any environment with or without food. They enjoy working and participating in training. To them it is a game and loads of fun and that is my goal. Traditional methods may not use treats, but they use a correction. Something is still being added. I choose to add something pleasant such as food instead of something unpleasant. The result is a much happier and cooperative eager worker! Positive training is not hard to learn and dogs learn fast. Best of all, the dog never becomes stressed or anxious, but happy and a willing participant. Don't get me wrong, you can correct a dog and he can learn. The only problem with punishment is that it has to be delivered each time the behavior occurs and some dogs become tolerant to the correction. You then have to increase the correction as the dog adjusts to it. I do not want to have to keep doing this and to me it is borderline abusive. Punishment also damages the relationship and can often cause avoidance in dogs. Often the dog ignores the owner and wants nothing to do with them. Imagine if someone was to consistently nag you, yell at you and constantly say no at everything you did. I don't think you would want to interact with that person too much. Fortunately dogs are very forgiving. I could ramble on and on about all the benefits of positive dog training, but the results show themselves. Find a positive trainer in your area and reap the rewards it produces. You will not only be thankful, but your dog will thank you too! who know how to listen."